UCLA student Ian Davies (in the foreground) is working with three other students to install two new campus community gardens. Their project was funded by the UC Global Food Initiative, which was announced by UC President Janet Napolitano during a visit to UCLA last July. Alas and Moreno, who started these projects in the fall quarter when they were taking a class on filmmaking for social change, are now expanding their documentaries, thanks to a $2,500 fellowship that each student received from the UC Global Food Initiative Student Fellowship Program. The University of California Global Food Initiative, launched in July 2014, is a systemwide commitment to harness UC resources to sustainably and nutritiously feed the world’s population by 2025. Moreno and Alas are two of 16 UCLA undergraduate and graduate students to receive funding from this initiative to support four projects. 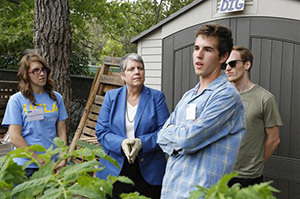 Other funded UCLA ventures include a research project to evaluate the impact and sustainability of farmer hubs in California that sell to large institutions — such as school districts and universities — and the creation of two new student-run vegetable gardens at UCLA that will be used to educate others about the benefits of a campus garden. A raised bed garden is scheduled to be built at Hershey Hall this winter, with an amphitheater garden to be installed at the Sunset Canyon Recreation Center in the spring. As a member of Mentors for Academic and Peer Support, one of 29 organizations operated through the UCLA Community Programs Office, Alas, along with two other UCLA students, is making a short documentary to tell the story of the Jordan High students and that of other urban gardeners in L.A.
“We chose to work on urban gardening because we believe that it strongly connects with current issues regarding health, food access and social justice throughout L.A.,” said Alas. Alas’ documentary will also feature a weekend gardener at Wattles Farm community garden in Hollywood and a Native-American woman who incorporates her ancestral beliefs into a gardening class she teaches at the Autry Museum’s Southwest Museum. In the next phase of production, Alas plans to allow the Jordan High students to shoot their own footage as they turn neighborhood blight into a neighborhood asset. Health, food access and social justice are also at the root of the documentary being produced by Moreno and her team of four. The film, which draws attention to the relationship between food advertising and childhood obesity, follows single mother Stefani Gilmore as she tries to feed her family of six nutritionally, using the federal Special Supplement Nutrition Program for Women, Infants and Children (WIC). Moreno’s team hopes to raise awareness of the issues faced by low-income and single parents and help motivate policymakers tighten up restrictions on advertising that markets food to children. “I know what it’s like to be constrained monetarily and nutritionally,"` said Moreno. “It surprises me that more people are not aware of the realities faced by people in their own neighborhoods.” It’s not true that poor people eat fast food because they’re lazy and don’t want to cook for themselves, she said.